“Ask Omegawave” is an educational series during which we will be engaging in informal Q&A sessions with members of Omegawave’s science team, including Co-founder Val Nasedkin and our Director of Research and Science Innovations, Roman Fomin. Question: For practitioners already using Omegawave Coach to support their training programs, what are the greatest benefits of the features now available with Coach+? 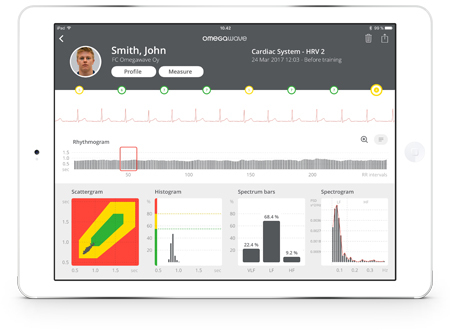 Val Nasedkin: Using our existing Coach solution, that coach will see Omegawave’s conclusions regarding their athletes’ functional state, but they might not always recognize the complete picture of why that conclusion was drawn. Access to these indexes will give the coach more background information on how our conclusions are reached—now, by analyzing these additional graphs, they have the ability to understand not just the conclusion, but what factors derived that conclusion. That level of understanding will make them more powerful as coaches, because it significantly increases their ability to make informed decisions. Roman Fomin: For the HRV screens, the most significant benefit of looking at all of these graphs is that we can present the athletes’ data across different formats. So, if you are using a different HRV tool, you will see a number, just one number, probably RMSSD, which is an isolated, scientific HRV variable. Any isolated number can be, by definition, limited when applied to different situations. Sometimes, in fact, that one number is not informative at all and cannot be beneficially used in a particular case. When statistical methods are providing inconclusive data, we can deliver information using geometrical methods like the scattergram and histogram. It doesn’t matter what the particular number of the RMSSD is, we are using different methods that can be used for even more abnormal rhythmogram evaluations. If you cannot use statistical methods, you can always use geometrical analysis or a graphical method or the scattergram to evaluate the functional state of your athlete. Nothing in these graphs is “new”—all of these methods are widely accepted in the scientific community and well described in scientific literature. Q: For coaches new to these indexes, are there any general patterns they can initially try to look for in the graphs? RF: Ideally, I want to see a cloud pattern on the scattergram. A very tight, compact cloud (like a point) on the scattergram reflects low HRV. This is not a desired functional state for an athlete measuring at rest. Having a very spread-out cloud is also undesirable, as it reflects too high HRV. The optimal shape of the cloud—reflecting optimal HRV—takes the form of an ellipse, placed in the middle of the green area (not moved from the center of the green area). Additional benefits from analyzing the scattergram are that you can almost immediately recognize outliers in RR intervals and visually identify abnormalities in the rhythm regulation. For the histogram, ideally you should see a normal, symmetric distribution curve—an asymmetric histogram reflects imbalances in the regulation of heart rhythms. Looking at the spectrum analysis, I want to see an optimal ratio between LF and HF, and not too much VLF. Finally, on the rhythmogram I want to see some variations, but not too high. I don’t want to see too high bars or too low. It’s both a qualitative and quantitative analysis. So you can apply your visual evaluation on the qualitative side, and use the numbers for the quantitative. VN: Also, now they have access to the raw ECG signal that they can send to their doctor or physiologist for interpretation. That’s a huge benefit. They can learn how to interpret an ECG themselves or they can send it to professionals for analysis—it’s a great benefit, they can see different types of arrhythmias, all kinds of information by having this ECG. For coaches looking to better understand these indexes, I highly recommend looking into our “Omegawave: Theory & Practice” Manual, by Chris Morris, which goes into greater depth on analyzing these graphs. VN: As an example, if I’m a coach and I’m trying to make a decision based on the fact that an athlete is parasympathetically-dominant, and I know I need to create more recovery processes, if I don’t fix this condition right away, it could take me a week. And during that week, if I look just at the raw numbers, I might not see much change. But if I start looking at the pictures, even a slight change can be noticed visually. So, I know I am doing something right or, possibly, doing something wrong. So, the coach who understands these screens will be much better at understanding why these conclusions were derived, and if they are better at understanding why, they are in a much better position to take action to fix or to change any issues raised by the conclusion we’ve provided. If you understand the mechanism that led you to certain results, you are much more efficient about fixing the problem than if you don’t know the mechanism, but only know the conclusion. Q: Moving on from HRV to DC Potential, why is the shape of the stabilization curve important and what can a coach learn from seeing the curve that they can’t learn just from seeing a calculated DC Potential score? RF: Think again about qualitative and quantitative analysis—a DC Potential score is only a quantitative analysis. But now, we are starting to offer qualitative analysis. And though one is good, it’s always better to have both. VN: Our current system only allows you access to information about where your DC Potential stabilized. The final point. The new assessment also allows you to monitor the shape of the curve during the stabilization process, which has a lot more information about functional state in it. By seeing this visualization, once again, the coach can become much more powerful in making their decisions. Q: With a DC Potential score, coaches gain an idea of the level of CNS activation and wakefulness in their athletes… by analyzing the stabilization curve, what additional information can the coach learn? VN: You can figure out the lability of the nervous system, the hypertension, the anxiety states… certain qualities you can not see just from the stabilization points. RF: In short, we are trying to evaluate the athlete’s nervous system reaction—can their nervous system be spontaneously relaxed when they have to be relaxed? Or, are there forms of turbulence in their brain and body and they cannot voluntarily relax and be stable? So, we are trying to find limitations in the athlete’s nervous system, and doing that by applying a qualitative analysis of DC shape.